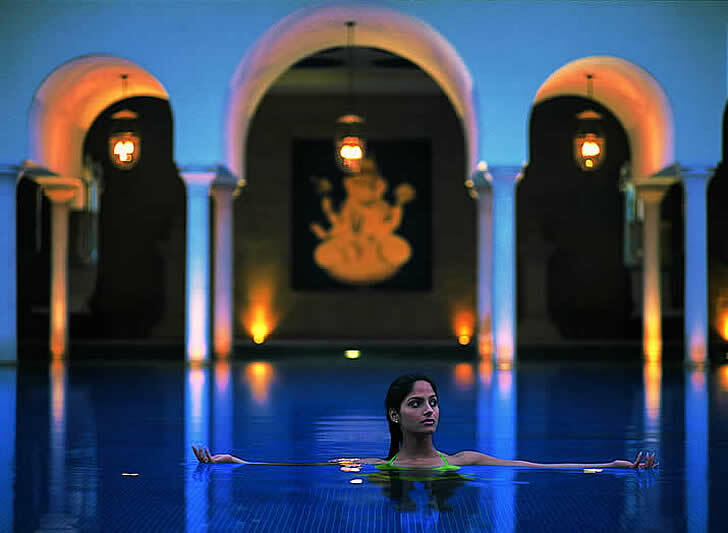 A romantic trip to India isn�t complete without a visit to the Taj Mahal and where better to stay than the luxurious Oberoi Amarvilas with a view of the Taj from every room, so you need never miss a sunrise or sunset view of one of the Seven Wonders of the World. The average guide-book may say that the road between Delhi and Agra is uninteresting, but for us, nothing could have been further from the truth. It's not every day that you see a bus intended for forty-five, that contains over a hundred people (not including those sitting on top of the bus), twelve passengers to a rickshaw intended for two, or a family of four on a motorbike. Then add to the mix cows, donkeys and water buffalo missing near head-on collisions with your tour operator's car, women on scooters riding side-saddle, and trained monkeys plastered to your window begging for change when your driver goes off to pay the border-tax, and you've got the makings of real entertainment. Boring? You must be kidding. We arrived at the extraordinary Oberoi Amarvilas that afternoon, exhausted because we were too mesmerized during our drive to catch a few winks. 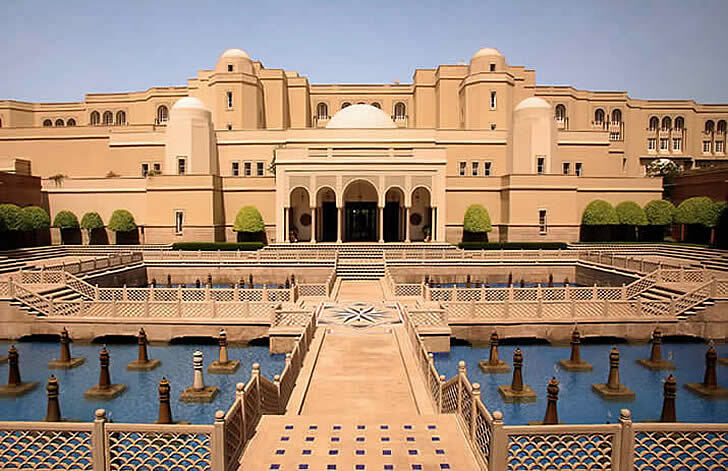 The hotel is a splendid combination of Moorish and Mughal architecture, and upon entering you must pass through a ceremonial entrance pavilion complete with fountains, filigreed stone bridges and tall pillars topped by torches. The effect is stunning. The lobby itself, with geometrically painted dome, a marble floor and huge arched windows, only six hundred meters from the Taj Mahal, was literally conceived as a visual frame for the Taj and the effect has been realized beautifully. 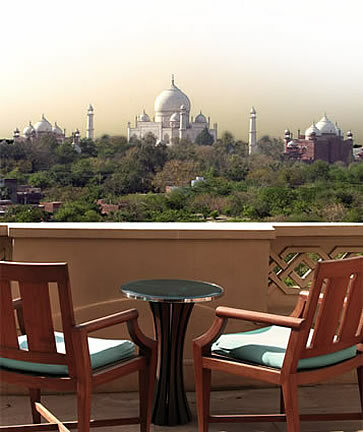 There is a view of the Taj Mahal from every guest room, bathroom en-suite and common area of the hotel. For those of you who know the story of the Taj Mahal, one of the Seven Wonders of the World, you�ll probably share the sentiment of the sheer romance of being so close to this monument to love. It was built in white marble by Emperor Shah Jahan as a mausoleum in memory of his Queen, Mumtaz Mahal. It is most stunning at sunrise and sunset, when the white marble of this immense structure glows a golden orange. The structure of the tomb, a gleaming white marble colossus, is surrounded by four huge 137 foot minarets which seem to be standing guard, and the long reflecting pool in front of it, the surrounding gardens and sandstone buildings add to its grandeur and importance. The decorative work, both inside and out appears to be the most magnificent fresco detail, but as you draw nearer, it becomes evident that it is comprised of an inlay of precious and semi-precious stones, fitted together with such fluidity and dexterity, that it seems as if one individual was responsible for the placing and polishing of every stone. Instead, it took 20,000 laborers, twenty-two years to complete it. The Emperor spent the last years of his life imprisoned in a tower which looked upon it, where he is said to have sat staring at the monument he had created, talking endlessly to his long gone beloved, until his own death. If that's not romantic, I don't know what is. 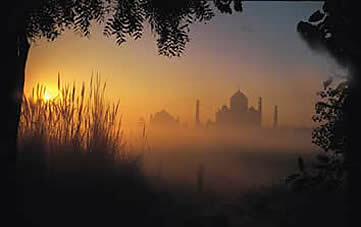 There is a view of the Taj Mahal from every guest room, bathroom en-suite and common area of the hotel. 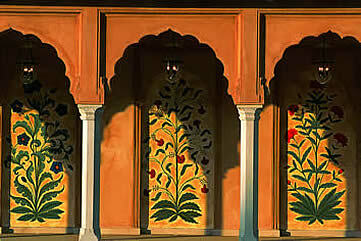 The second most visited site in Agra is the Agra Fort. Construction was originally started by Emperor Akbar in 1565, but his son, Jahangir, and grandson, Shah Jahan, made later additions. It houses the Dewan-e-Khas and Dewan-e-Aam (Halls of Private and Public Audience). Its walls and palaces are silent witnesses to the rise and fall of the Imperial Mughal Empire and feature a variety of ingenious Islamic inspired devices (some decorative, some more practical) within the fabric of the buildings. Back in our room and from our balcony, we could hear worshippers praying and chanting, as we watched the sun set on Lady Taj, her ice white colors changing from pink to soft oranges, and then suddenly to silhouette as the sun left the sky, and the lights of the Oberoi pool, terraces and waterfalls came up to compensate for the darkness. Steve took a rain shower in our 1 � meter-wide octagonal glass shower with gold filigree domed ceiling. I came in to take a bath that had been drawn while we were at dinner and strewn with rose petals. From the sliding glass doors by the tub, we could see the outline of the Taj in the distance, and the heat of the day became a distant memory. Let's just say that kind of romantic atmosphere doesn't take place every night at our house, but I'd consider repeating the experience when we get home (minus the rain shower, as I don't think it's in our budget). Why you'll love it Incredible guest recognition program; you will feel like a visiting dignitary. Good to know All rooms have an incredible view of the Taj Mahal. There is a private golf cart shuttle to the Taj Mahal. See the Taj and sunrise or sunset for best viewing. 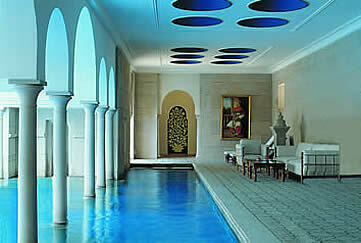 Hi, The Oberoi Amarvilas looks wonderful. Do you have any rooms available in February next year? Thanks.